Scrubbed and sanitized, the Carnival cruise ship Fascination left the Port of Miami Monday night hoping to avoid a repeat of the stomach virus outbreaks that struck nearly 200 passengers on its last cruise, as well as people on at least three other cruise ships in the past two weeks. The Centers for Disease Control and Prevention, which handles health issues on cruise ships, oversaw the cleaning of the Fascination before its current voyage, and took samples from passengers on the earlier cruise. Those samples will be tested to see if the virus that sickened Fascination's passengers was a Norwalk-like virus, similar to the bug that hit Disney and Holland America liners last week. Meanwhile, a Radisson Seven Seas cruise ship reported 18 suspected cases of salmonella food poisoning, a gastrointestinal ailment unrelated to Norwalk-like viruses. Fascination departed from Miami around 7 p.m. Monday, destined for a Tuesday morning stop in Key West, Fla., and a Wednesday docking in Cozumel, Mexico. Passengers aboard the ship were trying to focus on anything but a virus outbreak. "Everybody's treating it pretty much the same way," passenger David Martinez said in a cell phone interview from the ship early Tuesday. "Everybody's taking precautions about touching things and being careful, but everybody's trying to make jokes about it, too." Ship officials told passengers details of the presumed Norwalk-like virus outbreak that plagued the Fascination's three-day trip to the Bahamas. But there was little information about the precautions taken to avoid similar problems on this sail, Martinez said. There were no reports of passengers on the current Fascination trip falling ill during the first few hours of the voyage. The CDC was expected to continually monitor the overall health of passengers on the current voyage. When the Fascination returned from its trip to the Bahamas early Monday, it carried 190 passengers and four crew members who suffered from vomiting and diarrhea, Carnival Corp. spokesman Tim Gallagher said. Experts had not confirmed whether they had a Norwalk-like virus, Gallagher said. The viruses have plagued more than 1,000 people on other cruise ships in the past few months, including Holland America Line's Amsterdam and Disney Cruise Line's Magic, causing those companies to cancel one sailing each to thoroughly disinfect the ships. The number of gastrointestinal illnesses on cruise ships has declined since 1990, CDC spokeswoman Bernadette Burden said Monday, although she said the CDC does not have exact numbers. 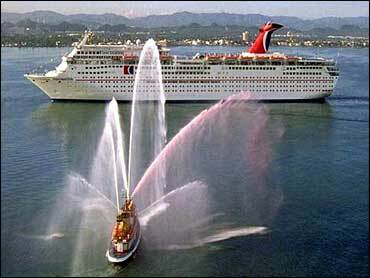 Carnival Corp. president Bob Dickinson said completely preventing any passenger from developing symptoms of the Norwalk-like virus would be impossible. "You cannot prevent this disease," Dickinson said. "The Centers for Disease Control (and) the U.S. public health service has no known method or protocol for the prevention of this disease." The Norwalk virus, named for an outbreak 30 years ago in Norwalk, Ohio, and a group of Norwalk-like viruses are among several common micro-organisms that can cause diarrhea, stomach pain and vomiting for 24 to 48 hours, according to the CDC. They are spread through food and water and close contact with infected people or things they have touched. The incubation period is about two to three days. The illness is seasonal, peaking in the colder months, and is not uncommon, said Dr. Steven Wiersma, the state epidemiologist. There were no reports Monday of any illness aboard Holland America's Amsterdam. The Amsterdam, which was held at Port Everglades in Fort Lauderdale for 10 days to be disinfected, departed on a 10-day Caribbean cruise Sunday with 1,261 passengers. Holland America Line Inc. also is owned by the Miami-based Carnival Corp.
About a dozen passengers aboard the Amsterdam's sister vessel, the Statendam, also complained of flu-like symptoms before the ship arrived in San Diego Nov. 25. A few weeks earlier, 42 passengers on the same ship became sick. A lawsuit seeking class-action status was filed in Canada in August on behalf of passengers of the Holland America Ryndam, who fell ill on an earlier cruise.